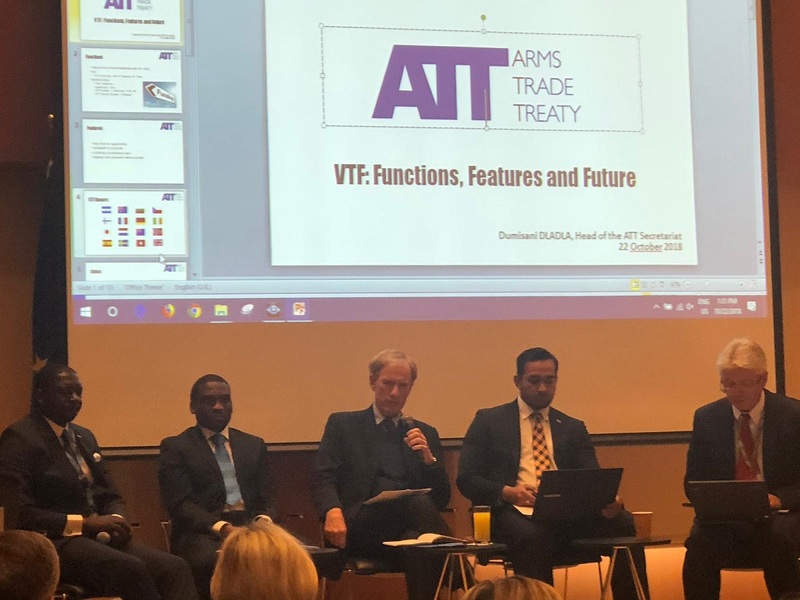 On 22 October 2018, the Permanent Mission of Germany to the United Nations partnered with the Arms Trade Treaty (ATT) Secretariat to hold a First Committee side event on the ATT Voluntary Trust Fund. Participants in the panel discussion explored various aspects of the Voluntary Trust Fund established under the Treaty, including its grant application process. The panelists included Ambassador Jānis Kārkliņš, Permanent Representative of Latvia to the United Nations and President of the upcoming Fifth Conference of States Parties to the Arms Trade Treaty; Mr. Dumisani Dladla, Head of the ATT Secretariat; Ms. Irina Albrecht, Head of the Outreach-Projects-Policy Division at the German Federal Office of Economic Affairs and Export Control; Mr. Dominic Misiolo Sofe, First Secretary of the Permanent Mission of Samoa to the United Nations; and Mr. Eugine Ngalim, Executive Director of the Cameroon Youths and Students Forum for Peace. Ambassador Kārkliņš highlighted the work carried out within the ATT framework to regulate the international conventional arms trade. He also explained the role of the Trust Fund in advancing the Treaty’s objectives. Mr. Dladla said the Trust Fund has made $6.7 million available for 24 approved projects to date. Of those funds, 67 per cent have gone to ATT-related projects in Africa, 21 per cent to projects in the Americas, 8 per cent to projects in Oceania and 4 per cent to projects in Asia. He identified the Trust Fund’s 16 current donors—Argentina, Australia, Bulgaria, Czech Republic, Finland, France, Germany, Ireland, Japan, Netherlands, New Zealand, Norway, Spain, Sweden, Switzerland and the United Kingdom. Other speakers brought forward various aspects related to funding and implementation, after which discussion followed.